Today’s Marisole Monday fantasy gown is sort of Ancient Greek inspired, but also a bit wedding dress inspired. A dear friend is getting married in November, so I guess wedding gowns have been on my mind. I’ve become particularly smitted with Marchesa Notte’s designs. I’ve had as soft spot for Marchesa Notte’s work for a while. It’s so delicate and lavish, that I’ve never felt comfortable trying to reproduce it on paper. Her Resort 2018 collection and her Fall 2016 collections are pure eye candy. Boots took on the challenge and drew 2 plates of Marchesa Notte evening gowns (Plate 12 and Plate 14) for her Catwalk Couture Collection. They are glorious. Anyway, for my fantasy version, I took off the lace (because I hate drawing lace) and added some additional sleeve details and jewelry. I wanted the gown to feel like the sort of thing you could walk on the beach wearing a perfume commercial. You know, the kind filmed with exotic music and soft focus lighting. Accessory wise, she has a crown and a book, mostly because I love to draw books. If you’re a patron, there’s a different color version of this gown up there to see. If you’re not a patron, consider joining. It really helps offset the blogs costs. Personally, when it comes to sundresses, I am strictly a maxidress kinda girl. However, paper dolls get to wear anything I feel like, so we have a mix of two sun dresses today for Marisole Monday and her Lady Friends. These dresses will not fit the gents, I’m afraid. I have been neglecting the gents of the Marisole series as of late. I should really do something for them soon. Until then, I created these dresses for Marisole. They are both based on lightweight knit t-shirt sorts of dresses I have been seeing in the stores and in the magazines I read. I am very proud of the pattern on the warm grey dress, but not completely happy with the purse. It feels too structured for the dresses, but too late for it to change now. I confess that until school starts, I tend to not get a feel for what students are wearing. I work at a college, so when the classes are in session, I feel like I get a good feel for what college students seem to be into these days. As always, I love to hear what y’all think in the comments. Oh, and I hope people take 15 minutes out of their day to go see the eclipse today! I’ve got my glasses thanks to my Mom and am ready for the event. 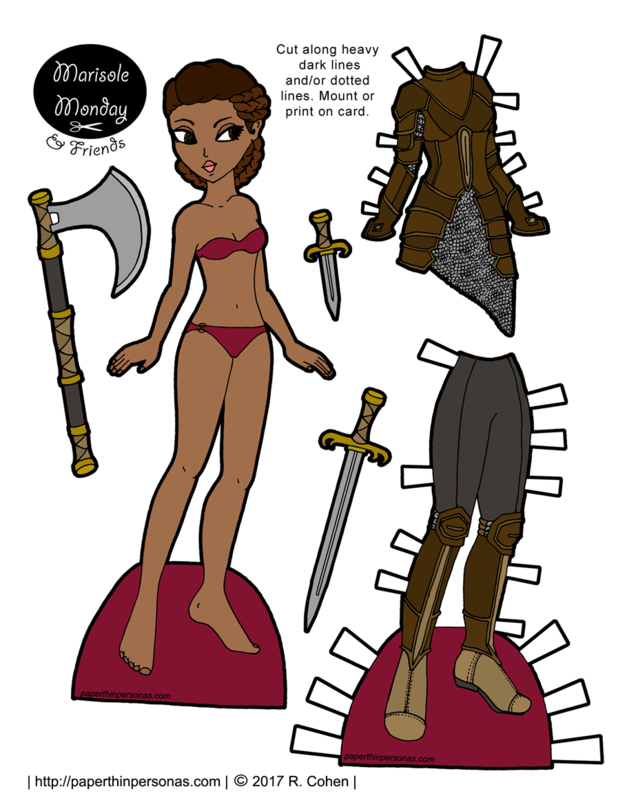 All paper dolls are about fantasy to some degree. After all, much of the armor I draw wouldn’t protect you very well and plenty of the gowns I draw would be hard to walk it or move in, but I still draw them. I do care about some levels of realism. 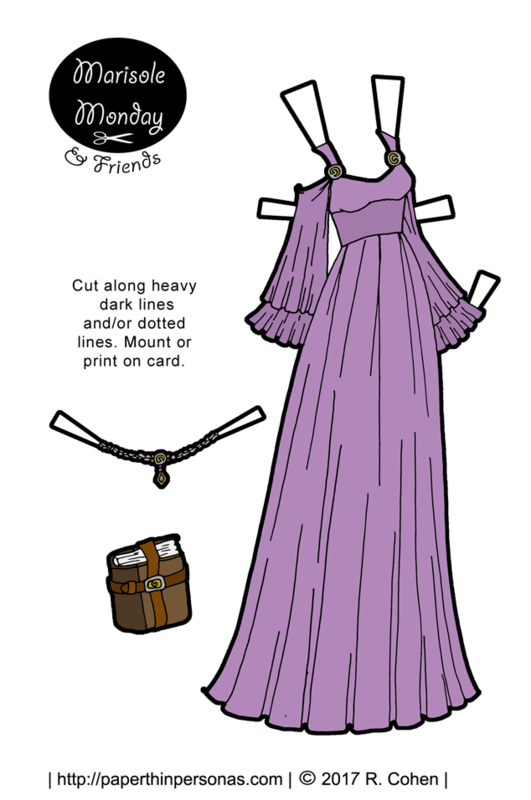 I like the for my paper doll clothing to ‘make sense’ in so much as, I want them to actual be able to exist. It matters to me that layers layer properly and such. Fabric looks like fabric. You know, those sorts of things. But practicality belongs somewhere other than in the realm of paper dolls. 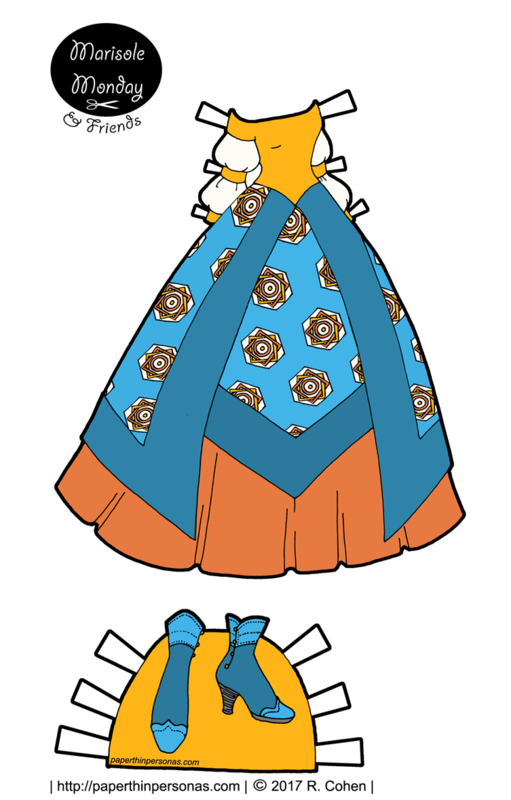 This dress went through three color schemes or so, before I decided I like this yellow, blue and orange option. One of the other color schemes, is up on the Patreon page for my patrons. So, if you’re a patron hop over to see it and if you’re not, consider joining. It’s a fun time. As always, I love to here what you all think in the comments. So, it was pointed out to me earlier this year that I had done very few sets of paper doll pajamas. 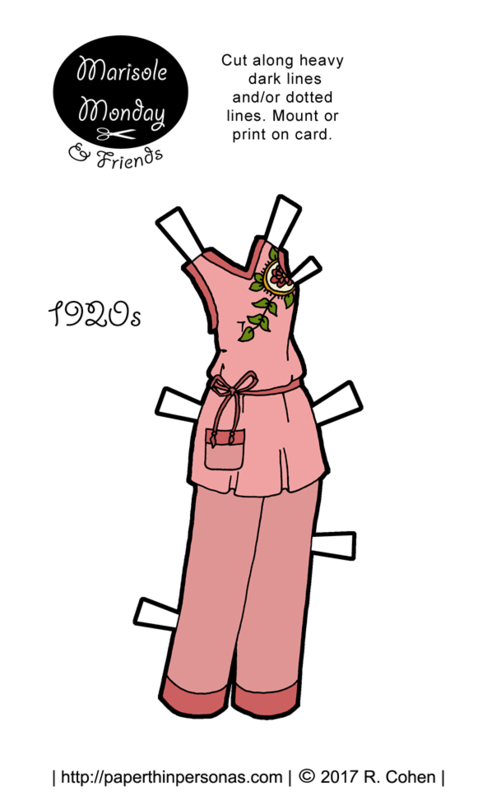 As a result, I’ve been working on creating paper doll pajamas for the various series over the last year. Every paper doll needs pajamas, after all. Sadly, the illustration was in black and white, so I have no idea the true color of these pajamas. However, I know coral was a popular shade in the 1920s, so that is what I went with. I love the art deco floral design on the right side of them. One pair a pajamas is hardly enough to make up for years of pajama paper doll neglect, but hopefully this pair helps a bit. And I think it could pass as super comfortable lounge wear in the 21st century. I’d wear it. What do you think? Would you wear it? Let me know in a comment. And if you want to support the blog, think about donating through Patreon. 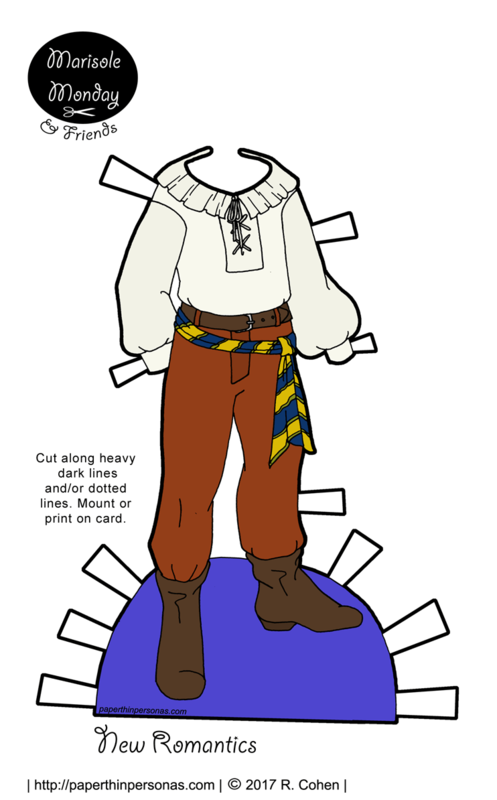 While I was researching New Romantics fashion for yesterday’s printable paper doll, I discovered that it was a lot easier to identify men’s clothing that was influenced by the style than it was women’s clothing. I do sort of regret not going further and doing like an Adam Ant sort of outfit… but there is always next time. This isn’t the usual way I design paper doll clothing, but I do think you have to the adapt to the medium as it makes sense. In fact, I just finished penciling a regency Sprite’s men’s suit that does the same thing. Sometimes, it is easiest to draw outfits in one piece, even if that’s not my natural instinct. 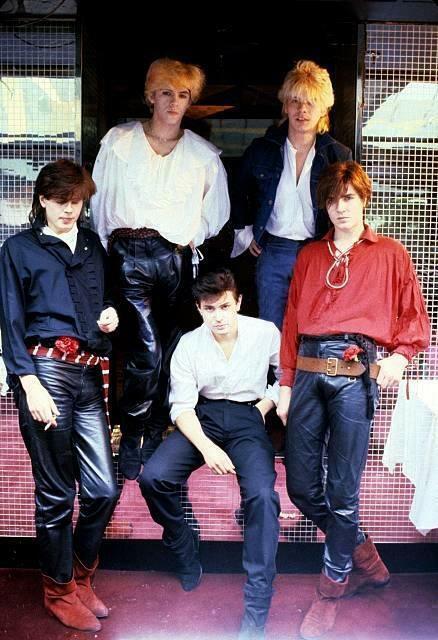 Now, I will admit that while I don’t know much about New Romantic fashion, I do have a soft place in my heart for a man in a poet shirt. Can’t lie about that one. I should add my favorite Adam and the Ants song is Stand and Deliver, but I should say in the interest of full disclosure that his music is more New Wave Punk than New Romantics, or so I’ve been told. Meanwhile, I don’t really have a guy paper doll with quite the right hair for this outfit, but I might actually recommend Marcus The Warrior. The beads in his hair seem apropos of the style. Super long haired Mikhail might also work, but not as well. As always, let me know what you think of poet shirts or paper dolls or anything else in the comments. 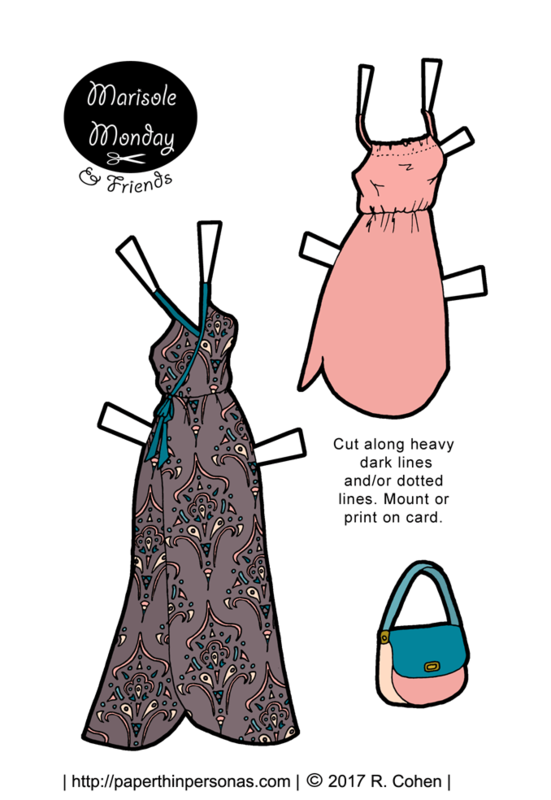 Need a Marisole Monday & Friends Guy Paper Doll to wear today’s outfit? Pick One Out Here.